The Resource Centre is a collection of publications and other helpful materials for download. To search just the Resource Centre, enter a term below and use the filtering options on the right. To search the entire IFAW website including web pages, blogs, press releases and videos, enter a global site search here. Free Images available to download within the terms of Creative Commons license. Featuring experts in conservation and animal welfare from around the world. Gaining Ground: In Pursuit of Ecological Sustainability, Lavigne, D.M. (ed.). 2006. 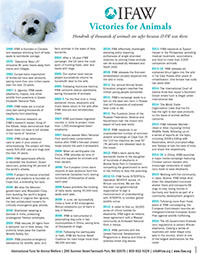 Published by the International Fund for Animal Welfare, Guelph, Canada, and the University of Limerick, Limerick, Ireland. 425 pp.